Discover the White Mountains by Snowmobile! Reserve Your Kayak or Canoe Today! 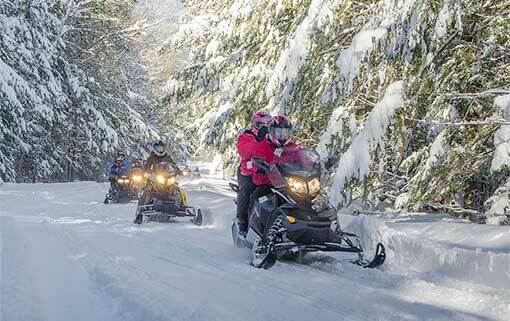 Northern Extremes offers two locations in the White Mountains of New Hampshire with the opportunity for self-guided snowmobile tours and rentals at each of our scenic locations. Our Bartlett location is perfect for families and novice riders, offering a closed-loop system, virtually impossible to get lost in. Our Bretton Woods location is the gateway to the Great North Woods, offering hundreds of miles of groomed trails. 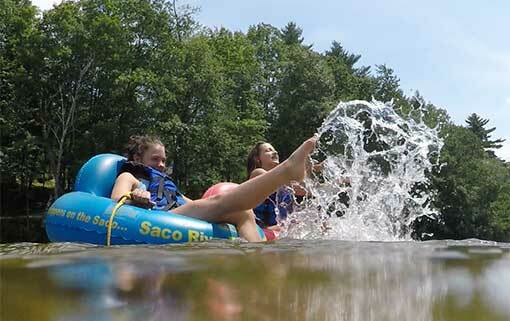 Northern Extremes offers canoe, kayak, and tubing rentals on the Saco River, which averages 3 feet deep (some short sections are deeper) with some small rapids, lots of sandy beaches and some rope swings. Known for its sandy beaches and crystal clear water, the Saco provides outdoor recreation opportunities for the whole family. Paddling the Saco River creates a lifetime of memories and brings family and friends together. And don’t forget to bring the family dog! Discover the amazing White Mountains by snowmobile with Mount Washington as a backdrop with Northern Extremes. The Saco River is waiting … are you ready? reserve your tube, kayak, or canoe today and be ready when summer arrives! We can help you create your own Tubing Regatta! Northern Extremes can handle groups of up to 100 people. Give us a call!